The new particle, named Xi-cc++ (pronounced Ksī-CC plus-plus), is part of a family of ‘doubly charmed baryons’ that are predicted to exist by the Standard Model theory of particle physics, but this is the first time scientists have been able to confirm their existence. Previous attempts to find doubly charmed baryon particles have been inconclusive, and findings had appeared to disagree with the Standard Model, puzzling scientists. However LHCb data collected last year contains more than 300 of the new Xi-cc++ particles. Nearly all the matter that we see around us is made of baryons, which form the nuclei of atoms and are composed of three quarks. The most commonly known types of baryon are protons and neutrons, which are made of the light ‘up’ and ‘down’ quarks, and make up the overwhelming majority of the ordinary matter observed in the universe. However there are six types of existing quarks, and theoretically many different potential combinations could form other kinds of baryons. All previously observed baryons contain, at most, one heavy quark; this is the first time that we have conclusively observed one with two heavy charm quarks. Baryons with one heavy quark, such as the ‘charm’ or ‘beauty’ quarks, have also been observed routinely in cosmic rays and at accelerator facilities, such as at CERN’s Large Hadron Collider (LHC). 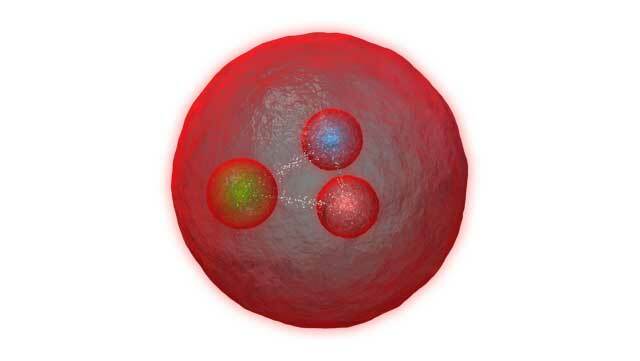 The new doubly charmed Xi-cc++ baryon contains two heavy charm quarks and an up quark. In contrast, a proton has two up quarks and a down quark, and a neutron contains two down quarks and an up quark. As a result the Xi-cc++ particle has a mass of 3621 MeV/c2, which is around 3.5 times heavier than protons and neutrons. Another feature of the Xi-cc++ particle is that it has double the electric charge of a proton (it has two positive charges, while the proton has only a total charge of +1). This is because each of the charm and up quarks have a charge of +2/3, so the total charge of the three is +2.